Printed on Hahnemuhle Photo Rag paper with 12-color archival inks, fine art prints have a smooth surface and feel making them very versatile and ideal for black/white or color reproductions with impressive depth. 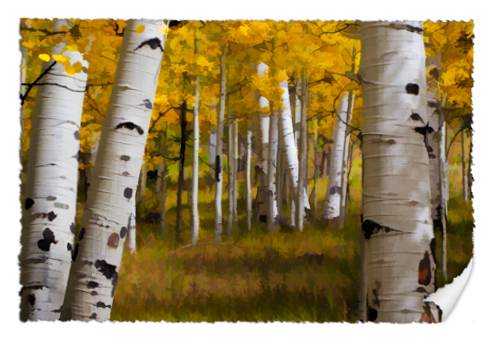 Ideal for digital outputs, Photo Rag prints are best suited for computer generated artwork with common applications including both photographic and fine art reproductions. Providing excellent image sharpness and optimum color gradation, Photo Rag prints are produced on a 100% rag based paper that is resin-coated to offer a higher level of water resistance. How do you print my images? Except for economy prints, prints on metal and press printed products, all images are printed with 12-color inkjet printers. When compared to traditional silver halide prints, our inkjet prints have better reproduction color and quality due to the controllability and number of colors available for output. Our prints are synonymous with “Giclée” Prints, which simply means a digital fine art print made on an inkjet printer, which our prints are. What is the archival life of your prints? Except for economy prints, prints on metal and press printed products, our inkjet prints (Premium Satin and Gloss, Metallic, Fine Art Photo Rag and Canvas) are all rated for a print permanence in typical display settings of at least 75 years for color images and at least 200 years for black and white images. When kept behind UV protective glass/glazing, coatings and laminates, the longevity increases beyond 95 years, in some cases beyond 300 years. What size is a wallet print? 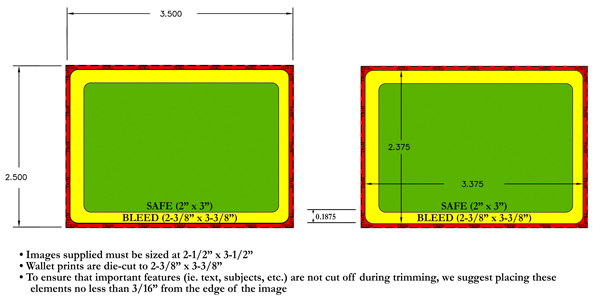 A wallet image is printed at 2.5” x 3.5”, and then trimmed with rounded die-cut corners for a final output size at 2.375” x 3.375”. What lamination options are available? Can I mix paper types for an order? Yes, you can add and mix different paper sizes and/or types within orders as long as they are within the same product catalog. For information about adding or mixing different product types and sizes, please refer to FAQ 3.14 Can shipping be combined for separate or multiple orders? FAQ. Unlike traditional silver halide processing, we do not back-print on our paper. Available up to a maximum width of 43" in. and a maximum length of 120" in.